WWE brings us their first co-branded Backlash in almost 10 years this Sunday live on the WWE network. In 2018, the WWE announced that they are going back to having every pay-per-view be co-branded and it all starts at this year's Backlash. Although this might be considered an extended fallout of WrestleMania 34, the stakes of each match has never been higher in this first co-branded Backlash in 10 Years. Here’s what you need to know for Sunday's Pay-Per-View. When: The event will take place on Sunday, May 6th. It will start at 8 PM Eastern Time, 5 PM Pacific Time, and 1 AM British Time (technically on Monday, May 7th). In India and Australia, it will technically start on Monday, May 7th. It will start at 5:30 AM India Standard Time and 11 AM Australian Eastern Daylight Time. The Kickoff Show will start one hour prior to the main start time, so 7 PM Eastern Time, etc. The main show is scheduled to last approximately three hours and may be followed by a fallout show on the WWE Network. Where: As always, Backlash is available on the WWE Network which can be viewed through most media devices. The WWE Network is only $10 a month and new subscribers can sign up for a free trial that will allow you to enjoy Backlash. It is also available in the U.K. on Sky Sports Box Office for £14﻿﻿.95 (€21.95 in Ireland). It is available in Australia via Main Event for $24.95. It is also available in India on Ten Sports. If you’re in any other country, visit this link and select your country to see how to watch Backlash. 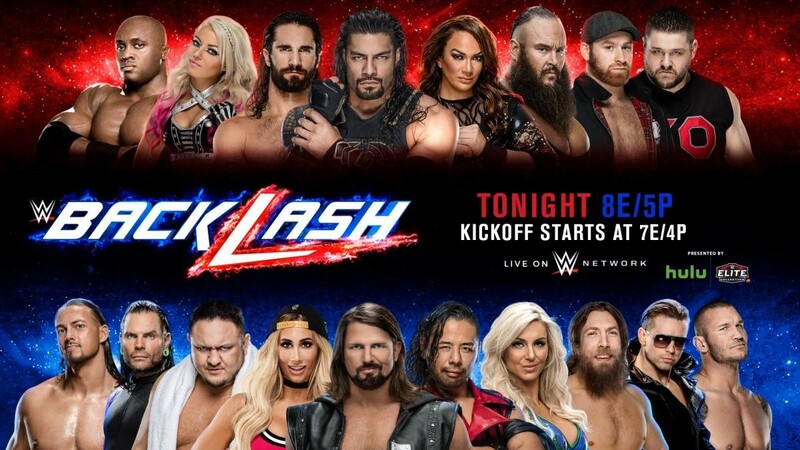 Kickoff Show: While Backlash will primarily be available on the WWE Network, the Kickoff will also have a free stream on WWE.com, the WWE App, YouTube, Twitter, Facebook, Google+ and Pinterest. While their WrestleMania 34 match was disappointing performance wise and their rematch at the Greatest Royal Rumble event was no better ending wise, we still have yet to see what each competitor has up their sleeve in this lengthy rivalry. Tensions are rising and with Shinsuke Nakamura's continuous low blows to WWE Champion AJ Styles, enough might be enough for the Phenomenal One as he looks to end his problems below the belt in this No Disqualification match. This has been the best Shinsuke Nakamura the WWE has seen since his days in NXT but only this time, he plays the villain and is once again hungry for gold. Expect a straight up fight, or a low blow contest similar to those stiff exchanges they do in Japan. Disappointed with the first two matches? You might not want to miss this grudge match. If losing the Intercontinental Title at WrestleMania 34 wasn't enough, The Miz was left in the middle of the ring alone by his Miztourage on his last night on Raw. After Seth Rollins came out on top at WrestleMania, he barely defended the title in a Ladder Match at the Greatest Royal Rumble when he snatched the title out of Finn Balor's reach. Rollins has a chance to validate his reign as Intercontinental Champion as he defends the title in a 1-on-1 match against the A-Lister. The Miz has fallen on tough times as of late but does he have one last dirty trick left and leave as Intercontinental Champion? Despite losing the title at WrestleMania 34, Randy Orton never got to avail of his rematch clause and had earn this shot at the recently crowned US Champion Jeff Hardy. Now with his Kryptonite Jinder Mahal traded to Raw, he now has a better fighting chance to reclaim the second title that Mahal took from him. Recently entering the Grandslam Club, Jeff Hardy will be facing a familiar foe though the two haven't met in the ring in several years. Which veteran will leave Backlash and head into SmackDown Live’s new era as the United States Champion? From real life best friends to sworn enemies on-screen, Raw Women's Champion Nia Jax looks to flick off the bug in her life which is Alexa Bliss. This is the night's only straight-up rematch from WrestleMania 34 and Jax looks to make the result the same. Since losing the title at WrestleMania, Bliss has been accusing Jax of bullying in a series of segments called her “Moments of Bliss”. This might look like a petty teenage rivalry but everything will go all serious as Bliss will have to put up or shut up as she faces Jax in what is her contractual rematch clause. In the second contractual rematch clause of the night, former champion Charlotte Flair faces the recently crowned SmackDown Women’s Champion, and former Miss Money in the Bank Carmella. The Princess of Staten Island is on the road to becoming the new “Ultimate Opportunist.” as she picked the right time to cash in after Billie Kay and Peyton Royce dished out an assault on Flair. Will The IIconics be involved again this time, or can Carmella prove that her first win was just a product of opportunity but no fluke? One came from a prestigious Samoan family while the other Samoan paved his own path of destruction without any historical family ties. Samoa Joe has warned Roman Reigns for weeks about facing Brock Lesnar but the Big Dog just had to find out for himself. Reigns has been having rough month as he failed to topple The Beast at WrestleMania 34, failed once again at the Greatest Royal Rumble. After a controversial ending, Reigns is looking to get back on the win column but Joe is looking to pick up the scraps and put the Big Dog down once and for all. With these men on different brands moving forward, it each would definitely want to give the other a brutal send off. Who will get the momentum moving forward? This is another one of those David vs Goliath type of rivalries only fuelled with envy and jealousy. Daniel Bryan shoed that he definitely still has it after putting up amazing performances at WrestleMania 34 and at Greatest Royal Rumble but the recent return of Big Cass might just be what brings him back to retirement. After several attacks on SmackDown Live and Cass spoiling Bryan's Greatest Royal Rumble moment, the leader of the Yes! Movement will look for revenge this Sunday, but can Cass prove himself the true superstar at Backlash? From the "YES! Movement" to the "YEP! Movement", Kevin Owens and Sami Zayn seemed to be fired up after a raucous and electric reception they received in their hometown of Quebec last Monday on Raw. The hometown heroes were not able to deliver however as they lost a six-man tag team match against Bobby Lashley, Braun Strowman, and Roman Reigns in the main event. They have a chance to avenge that loss as they will be facing the living Greatest of All Time in Strowman and the "Walking Armageddon" which is Lashley. While their opponents have the size advantage, they are a fairly new team which means that Owens and Zayn have the chemistry advantage. Will it be cohesion or collision who comes out victorious at the end of the night? What are you most excited to see at Backlash? Let us know in the comments below!